The comparison microscope is the mainstay of forensic science allowing two objects or samples to be compared side by side. While the primary use of this type of instrument is criminology as in ballistics, other scientific fields including paleontology and archaeology utilize these special compound microscopes. What is a Comparison Microscope? Comparison scopes are two compound light microscopes that sit side by side and allow the user to view both specimens through a center eyepiece that displays both images. Compound microscopes are microscopes that use multiple lenses to magnify an image for study. The images from the comparison instrument can also be transferred to a computer monitor, television screen or sent via the Internet to a remote computer. The ability to view two samples simultaneously allows them to be meticulously compared to see if they are identical or different. The primary use of these types of dual microscopes is in forensics, a discipline that uses science and technology to help solve crimes by providing factual evidence and linking crime scene evidence to a suspect or location. Tools create specific marks, bullets have signature marks, hair can be human or animal and using two compound microscopes to study a known sample against a collected piece of evidence can confirm an objects origin. Having multiple eyepieces, image magnifications ranging from 6x to 400x depending on the microscope model and image viewing options including left or right views only, side by side views of both samples and superimposed viewing places one image on top of the other for comparison. A number of forensic microscope companies use components from the primary microscope providers, including Leica, Zeiss and Olympus. Leeds Forensic Systems offers a number of systems that use Olympus and Zeiss optical components. Leica - "motorized comparison macroscope is used for a wide range of forensic investigations including ballistics, toolmark, and document comparison. Intelligent Automation combines with outstanding ergonomic design.The five apochromatically-corrected macro objectives feature a high numerical aperture and built-in, adjustable iris diaphragms for top optical performance.Different imaging modes (split image, superimposed image and combined image) are set at the press of a button. This convenient platform provides increased reproducibility, accuracy, and efficiency." FX C is a motorized macroscope that provides detailed study of a small section of a larger object. Intelligent Automation software provides a wide range of computerized options including virtual microscopy. Leeds Forensic Systems - Provides a wide range of forensic microscopes many utilize Olympus BX microscopic components that provide ergonomic eyepieces, uniform illumination and a variety of observation tubes. Leeds Firearms and Toolmarks - Microscope systems provide built in aperture diaphragms, large viewing area and ergonomic design with single knob focus. With image magnification of 5.5x to 55x as well as 6x to 102x and 16:1 zoom ratio and built-in aperture diaphragms, the Trace Evidence Comparison Microscope is a modular unit that allows it to be utilized by all forensic aspects of comparison microscopy. Some units provide a 22mm view and are capable of many contrasting options including bright and dark fields, phase contrast, polarized light and fluorescence. Dual view components allow systems to be used as a training microscope or for multiple-person viewing. Ken-a-Vision - (see below) Provides a cordless teaching comparison instrument that can be used for macro and micro samples. View options include independent and dual side viewing with illumination from the top or bottom. A full charge allows this teaching forensic instrument to be in use without power for forty hours. Forensic Comparison Microscopes - Offers three comparison instruments specifically designed for use in the field of criminal investigation. Their 10x by 144x magnification unit is portable and includes a USB digital camera system with ports for still photo or videotaping. The 40x by 600x forensic unit offers multiple illumination options including light direction allowing this unit to be used for metallurgical and epi-illumination applications. The 40x by 1000x compound unit includes both CCD video and USB still photo camera, unique screen options permit image reversal plus left and right side image views at 100%. This unit has a clean thin-line screen division allowing better comparison of samples without compromising clarity. 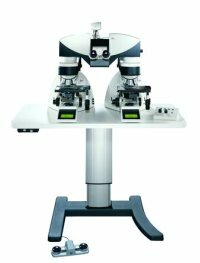 GX Microscopes: Units feature integrated micro and macro systems that includes two tilt-able stages, vernier controls and comes with multiple eyepieces and objective lenses. Accessories for units may include digital camera systems, and holding brackets for all types of items including bullets and cartridges that can be mounted to the microscope. Amazon.com offers comparison microscopes that are well priced and are solidly built by good manufacturers. Using a comparison microscope provides factual evidence that can help solve crimes, pinpoint historic dates and confirm signatures. Before this instrument was designed, people used their eyes for sample comparison studies, these types of compound light microscopes provide the tool to accurately confirm if two samples are identical.